Has Bishop Foys Properly Apologized to the Covington Boys? Happy Feast of St. Thomas Aquinas! In honor of the great apologist, my mentor in many things both spiritual and intellectual, I present a short treatise on Apology, in the modern sense meaning something like “a verbal expression of sorrow and regret for a fault committed”. Secondary sources are linked throughout, but you can access the primary source here: Bishop Foys’s 1/25 press release. Whether Bishop Foys Has Properly Apologized to Nick Sandmann and the Covington Boys? Objection 1. It would seem that Bishop Foys has properly apologized in his statement, “I especially apologize to Nicholas Sandmann and his family as well as to all CovCath families who have felt abandoned during this ordeal”, because the apology was made in a public press release, the same medium as the offending detraction. Objection 2. Further, the person most harmed was individually named in the apology and other less-harmed groups—“his family”; “all CovCath families”—were identified. Therefore Bishop Foys has properly apologized. Objection 3. Further, the apology recognizes and regrets the effect of the initial wrong—“who have felt abandoned”; “Nicholas has become the face of these allegations…this is not fair. This is not just”. Therefore Bishop Foys has properly apologized. Objection 4. Further, Bishop Foys reiterates that the Diocese is conducting an ongoing investigation which at this time he expects to exonerate and help the students; so the investigation is a form of reparation for public attacks against the students. Therefore Bishop Foys has properly apologized. On the contrary, the apology was issued at the end of a 48-hour-window given to the diocese by Nick Sandmann’s legal counsel to avoid being named in a libel lawsuit, despite the Bishop’s earlier promise that “We will have no further statements until the investigation is complete”, and a proper apology must be made for the sake of the wronged, not for the sake of the wrongdoer. Therefore Bishop Foys has not properly apologized. I answer that all perfect apologies must have seven parts, as illustrated by the parts of the Sacrament of Reconciliation and the Act of Contrition, and that Bishop Foys’s statement contains only one of these, and that imperfectly; further, that apologies made by someone in a position of superiority to an inferior must be greater as the distance in hierarchy or social position is greater, and Bishop Foys’s apology fails to demonstrate the magnanimity proper to his office; further, that an apology must be made with the purposes both of restoring to the injured party what was lost and of restoring the relationship between wrongdoer and victim to what it had been, and Bishop Foys’s apology manifestly intends neither of these essential purposes. And in the letter of apology in question on 1/25. An ongoing failure to exercise the full duties of his responsibility as Bishop over the Covington boys. When a child throws a baseball through the neighbor’s window, the child’s parent, representing the child, makes proper atonement for the child’s behavior by paying what the child cannot for the cost of the window, as Christ paid what we could not in atonement for our sins. Anyone in a quasi-paternal position of authority, especially within the Christian Church, assumes the same responsibility, in imitation of Christ, for all of his charge’s failings. The Bishop therefore ought to have come out on Saturday the 19th with an attitude of being prepared to sacrifice his own reputation in defense of his students, rather than sacrificing the students for the benefit of his reputation. An ongoing failure of prudential judgment: there is no serious question of legal action around the initial incident, but throughout all of last week and continuing as I write, damage is being done to the boys’ reputation by ongoing media attacks. The diocese has been cautious and slow to retract—in contrast to their rush to judgment—as if they were involved in a legal proceeding, when they are in fact involved in what the Bishop has fairly described as a “media circus”. It is possible to regret that one has been pulled into a media circus and still act appropriately, just as it is possible to be involved in a car crash and still act appropriately: you pull your children out of the wreck and protect them from further harm, before completing the analysis of what exactly caused the crash. The Bishop has failed to exercise this emergency protection over his students. While Bishop Foys does name the principal victim, Nicholas Sandmann, in his press release, this is inadequate because of the principle that a wrongdoer holding high office over the victim must exceed a precise reparation, as David says of the wealthy man who stole his neighbor’s lamb: “He must pay for that lamb four times over, because he did such a thing and had no pity.” –2 Samuel 12:6. Now, with regards to the manner of naming & addressing the wronged party, therefore, it is inadequate to name and address the victim merely via a press release when the wrong was perpetrated via a press release, but Bishop Foys ought to have issued an apology via at least one press release and more, such as an apologetic speech to the student body at Covington, and a personal visit of apology to the Sandmann home. 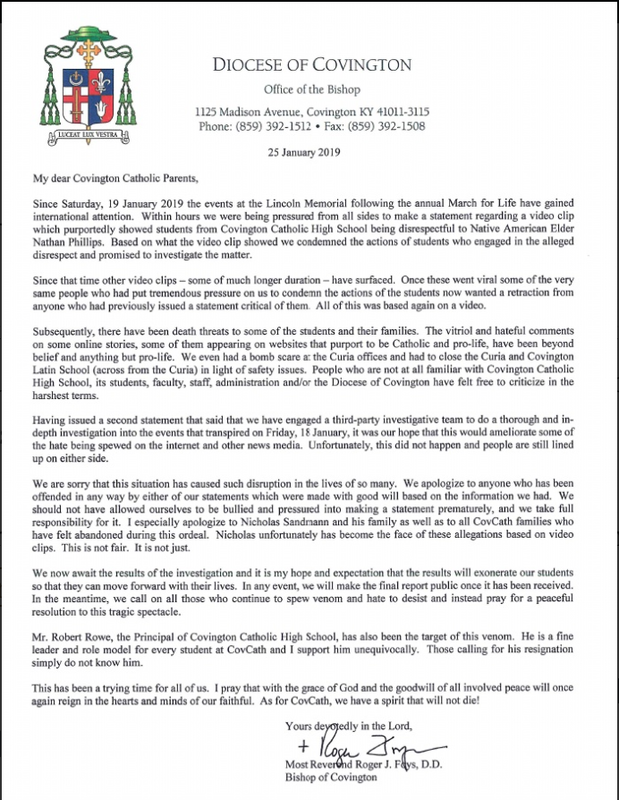 His apology names “all CovCath families who have felt abandoned…” but the Bishop’s actions harmed all CovCath families, whether or not they felt abandoned, so the conditional apology limiting the audience is insufficient. The other boys present on the field trip, and their families, ought to have been named as a special group in the press release. The Bishop ought to apologize to his entire diocese, for the injury caused by his actions to the reputation of the diocese. The statement separates the action (“our statements”) from the effect (“anyone who has been offended”). Note that the sentence betrays no indication that the Bishop repents of anything written in the two statements in question, only that he wishes people wouldn’t be bothered by them. Statement of Ownership. “I am heartily sorry for having offended thee…” An apology must show that the wrongdoer understands the full extent of his wrongs, both his actions and their effects. Bishop Foys’s apology fails to meet this requirement in several ways. Intent to Reform. “And I detest all my sins, because of thy just punishments…” A sincere apology must show the wronged party that the wrongdoer firmly intends never to repeat the same fault. In the Act of Contrition, this is accomplished by acknowledging the basest reason for reformation, the fear of punishment. Bishop Foys’s apology fails to meet this standard, in fact doing the opposite at every opportunity, by making it clear that if given the chance he would do the same thing again. First, this is clear from the foregoing on ownership. Reformation is not possible without ownership, as one cannot reform what one does not control. Plan for Good Conduct. “But most of all because they have offended thee, my God, who are all good and deserving of all my love.” As the Enumeration of Faults identifies what one did wrong, and the Intent to Reform states that one will no longer commit those same faults, the Plan for Good Conduct goes further in stating what positive actions one will do instead; this enables accountability to a specific plan and it shows the injured party that the wrongdoer understands what he ought to have done in the first place. This also fits the traditional summation of all ethics into “Do good and avoid evil”—we have covered “avoid evil”, but that is not enough; now we get to “do good”. For a Christian to do good towards God, one must give Him “all my love” as the prayer states. Bishop Foys fails utterly to satisfy this requirement, giving no indication at all of what positive actions he believes he ought to take should his students ever again be smeared in the media. This is unsurprising, as, without an Enumeration of Faults, a Statement of Ownership, or an Intent to Reform, there is no place for a Plan for Good Conduct. The Bishop insinuates throughout that his conduct is already good, that he is a fellow victim of the media, and therefore no alternate plan is needed. If he had made a full apology in other respects, Bishop Foys would be in a position to sincerely offer the use of his diocesan legal team to the students and their families, and even to offer to join any libel lawsuits as a fellow plaintiff and for the diocese to pay any necessary legal and related expenses. Similarly, he could have offered for the diocese to pay for all PR expenses. Offering the use of the diocese’s PR team, while theoretically noble, would not do here given the statements that have led them to the need for reparation. The Bishop could offer to write glowing character references for each of the boys, especially Nick Sandmann, when they apply for college or any jobs, in reparation for the damage he did to their reputations. Bishop Foys could publicly commend Nick Sandmann’s stoicism in his response to Nathan Phillips’s aggression, and could perhaps invite Mr. Sandmann to give him and his communications staff some training for how to respond in a Christian manner to “bullying and pressure”. Reply to Objection 1. Apologizing via press release to a wrong committed via press release, while appropriate between peers, is inadequate due to Bishop Foys’s high station in regards to the students, as stated in the response. Reply to Objection 2. While Nick Sandmann and other harmed parties were named, more is required for a proper apology, and the apology falls short in every other respect, as laid out in the response. Reply to Objection 3. These statements of regret, given the absence of ownership, are comparable to statements like “I’m sorry about the weather” and “I’m sorry for your loss.” They could be polite and meaningful coming from someone who was not, in fact, responsible, but they pile insult upon injury coming from the person who is at fault. Reply to Objection 4. It may be true that the investigation will help the students, and that would be a good thing if it happens. But it would not be to the credit of Bishop Foys, because it is not what he intended, and intent is central to any meritorious apology or reparation: you can’t apologize by chance. The intent of the investigation when it was first promised on 1/19 was to support “appropriate action” against the students, “up to and including expulsion”. When Bishop Foys now expresses his expectation that the results will “exonerate our students”, one wonders why the investigation hasn’t been stopped and an actual apology issued. I include here a personal note to Bishop Foys, on the off-chance that this post goes viral and you end up reading it: I dislike commenting on the news, and I would not distribute public charges if private ones were possible or appropriate. Alas, a private charge against a public figure over a public matter is neither possible nor desirable in this situation. I acknowledge that the complaints you have made about the difficult situation you were in are fair, as far as they go. I further acknowledge that your apology was not unusually bad, but merely usually bad; “par for the course” as public apologies go. That is to say, “not nearly good enough”. You get all the headlines saying you’ve issued an apology, because what else would they say? Without actually apologizing for anything. I can’t promise that I would do better. And yet, it is you and not I who are entrusted with one of the highest and most noble offices there is on this earth. Much, much more is needed from you.